I did not grow up with the cultural heritage of aprons. The only time I can recall my mother wearing an apron was on Thanksgiving Day. For her, that apron was a small symbol of protest. Moms did not have days off. She had to work while the rest of the family crowded around the TV set to watch the Macy’s Thanksgiving Day Parade. I must admit. She had a point. None of us ever offered to help. It was in Oaxaca that I rediscovered the apron. So beautifully crafted, the aprons of Oaxaca are omnipresent. I’ve come to understand their utility. When a woman puts on her apron, she is saying to the world, “Ok, now I’m getting ready to do some important work.” Yes, that’s why I’ve taken to wearing aprons. They assert a division in the day’s labor. 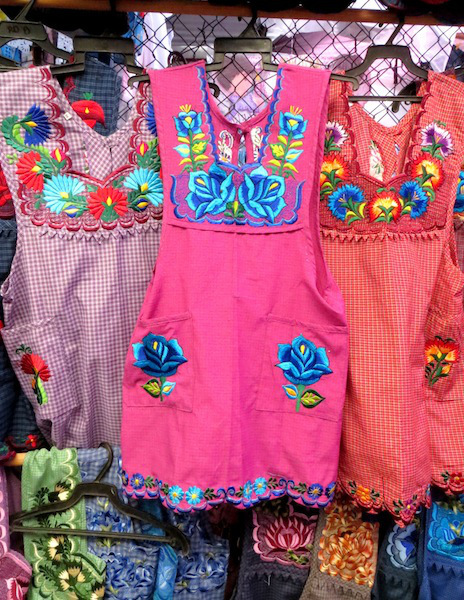 Want to know more about the aprons of Oaxaca? You can read about Martha, an apron maker from San Miguel del Valle, Oaxaca here.